You are here: Home » Global Ambassador » Our Summer Global Ambassador, Allyce, in Viterbo, Italy! Our Summer Global Ambassador, Allyce, in Viterbo, Italy! Ciao! 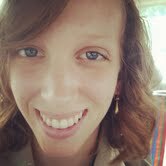 My name is Allyce Morino, and I will be studying with USAC’s 5-week summer session in Viterbo, Italy! I was born and raised in Modesto, California, which is about an hour and a half east of San Francisco. I am in my final year of college at California State University, Stanislaus, where I am majoring in English with a minor in Journalism. I am so excited to travel to Italy and share my experiences with the world and provide advice for students planning to study abroad in the future! First, one of the main reasons I chose the USAC program was because I have always wanted to travel to Italy. I am half-Italian, and my Italian heritage has always been a huge part of my life. I think traveling to Italy is the next step in learning about my heritage. What could be better than having the country and its history just outside your door? The USAC program interested me because it offered two locations: Torino and Viterbo. I liked having the option of choosing between a bigger city and a smaller town. Ultimately, I chose Viterbo after I read the course catalog and saw the golden course I’ve been searching for: TRAVEL WRITING! And an additional four-day field trip of Southern Italy for an extra unit?! SOLD! I felt there couldn’t be another program that suited my personal and career goals so well. Also, I liked the idea of living in a small town environment so I can dive into the Italian culture. Viterbo isn’t too far from Rome, and with so many different options for travel available, I felt that Viterbo was the perfect location for me. One of the best aspects of traveling is being able to share your culture with those around the world. If I were to bring something from my hometown to share in Viterbo, it would be the annual Official Kiwanis Classic Car Parade. 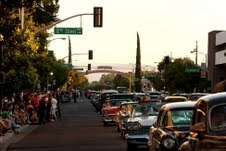 In this parade, hundreds of classic cars and hot rods drive through Downtown Modesto for hundreds of spectators lining the sidewalks. I even got to ride along with my uncle in his 1934 Ford Coupe a few years ago! From the 1950s through the seventies, it was very popular to cruise up and down McHenry Avenue in Modesto. Many do not know that George Lucas, director of the film American Graffiti (or perhaps better known as the creator of Star Wars), hails from Modesto. His “cruising” experiences were the inspiration for American Graffiti. I would share this gift because the parade not only serves as nostalgia for the older generations, but is also a look back in history for younger age groups, and I believe it would do the same in Italy. This parade is just one thing that makes the town of Modesto, California unique.